Saul struck blind on the road to Damascus. Peter in the act of being crucified. These scenes—the last frescoes Michelangelo ever painted—face one another on the walls of the pope's private chapel in the Vatican. Michelangelo was still working on them in late 1549 when the chapel became the site of one of the most important papal elections in the history of Christianity. At stake was the soul of the Western church: Would it remain in one piece, or would the divisions that had been tearing at its unity for a generation lead to a permanent rupture? Michelangelo's friend Reginald Pole—nemesis of Henry VIII and later Mary Tudor's archbishop of Canterbury—led in the voting throughout most of the election. He stood for a more personal, inward version of Christianity than many of his peers in Rome and sympathized with the almost unprecedented religious openness of this period. Above all, he was thought likely to seek an immediate understanding with the increasingly Protestant parts of Europe, especially Luther's Germany. The cardinals debated the future of the papacy for over two months within the embrace of a profound artistic message. Michelangelo had designed The Crucifixion of Peter and The Conversion of Paul so that when the pope turned toward the assembly in the chapel while celebrating the Eucharist, the gaze of the soon-to-be-martyred Peter struck him full in the face. A quick glance away brought the pope into confrontation with the stricken Paul, whose temporarily blind eyes directed attention upward to Christ, the source of Paul's, Peter's, and the church's authority. Both frescoes graphically illustrated the pope's absolute dependence on God. The papacy's outward majesty and power were nowhere in evidence. This was exactly the view that Pole developed during the election, concluding that the pope should model himself after the crucified Christ. Since Pole also refused to campaign, arguing that anyone who did automatically made himself unworthy of the office, he had a radically different understanding of the papacy than any of his immediate predecessors. These two frescoes have often been criticized as the efforts of a failing artist no longer capable of the magnificent work he had done in the adjoining Sistine Chapel. Seen in their proper context, however, they were in fact part of Michelangelo's last testament, along with the Rondanini Pietà. The views that Pole theorized in writing and Michelangelo painted were shared with their bosom companion, Vittoria Colonna. Before she died in 1547, the three had known each other for almost 15 years. Their common, highly personal faith represented a broad and deep challenge to the current state of the institutional church in favor of a return to a simpler, purer version of New Testament Christianity. It was one of the most tumultuous periods in Christian history. A principal cause was the state of the papacy. Once the arbiter of Christendom, it had suffered a serious decline in prestige. Since the 13th century, the papacy had gained an enviable position of authority (and sometimes power) by promising Europeans that they could bring any and all problems to Rome and the pope would solve them. This promise proved wildly popular but difficult to keep—and, by the late 15th and early 16th centuries, impossible. After the French invasion of Italy in 1494, the popes struggled under increasing political and religious pressures. Not least among these was the movement of renewal launched in Florence by Girolamo Savonarola. Savonarola believed that the Apocalypse was rapidly approaching, and that the Antichrist was the pope. He preached the importance of inner faith, as well as the necessity of restoring the republic in Florence. Savonarola is only one example of a climate of radical religious experimentation not seen since perhaps the 12th century. The most well known of these experimenters today is Martin Luther, who insisted that ordinary believers could be saved through faith in God's grace, which they could know by reading the Bible. But these ideas were not unique to Luther. They had much in common with a broad spectrum of Christian thought in the late Middle Ages derived more or less directly from the letters of Paul, often read (as Luther did) through the lens of the early church father Augustine. The popes were slow to respond to these challenges. On the one hand, they saw Luther as just another apostate monk, and on the other hand, they failed to recognize the potential in the religious renewal going on in their immediate vicinity. As a result, they lost some of their ability to provide central direction and provoked serious questions about prevailing notions of authority. But under the leadership of Pope Paul III, the foundations of what is sometimes called the “Catholic Reformation” began to be built. Paul III appointed reform-minded people like Pole as cardinals and called the Council of Trent, which met intermittently from 1545 to 1563 to discuss the need for reform and to formulate a response to the Protestant challenge. As external institutions seemed near collapse, Michelangelo's faith grew more and more inward-focused. He used his art—whether painting, sculpture, drawing, or poetry—to recover an understanding of Christianity rooted in the believer's own experience. Following the apostle Paul, Michelangelo conceived of salvation as entirely dependent on God's grace. The believer's best efforts, even a believer as driven as he was, could contribute nothing: “all my efforts apart from your blood do not make a man blessed” he wrote in a poem. Outward rituals and observances do not save, although it is unclear how much of a role Michelangelo and his like-minded friends saved for the sacraments. They all sought a deeper relationship with Christ that became almost mystical. with prompt help and complete pardon. Michelangelo expressed his point in the language of the unconditional gift, both real and metaphorical. At first, Colonna had trouble grasping the concept that “grace cannot be bought” (as Michelangelo wrote in a letter). When words literally failed him, Michelangelo turned to the more congenial medium of art. He invented for her the “presentation drawing,” a drawing intended to be finished and given to someone rather than used as a model for another work of art, as was usually done. Through their subjects, Christ crucified and the Pietà, as well as his refusal to accept anything in return, Michelangelo showed Colonna the unconditional nature of Christ's gift. Colonna at first tried to reciprocate by presenting him with manuscripts of her poetry or asking for copies of his work for others, completely misunderstanding his purpose. Eventually she understood his point so well that she could convert it into words in “The Lament on Christ's Passion,” stating that the gift of grace through Christ's suffering and death was the only means of salvation. The similarity of these beliefs to Protestant tendencies did not go unnoticed. From the safety of Geneva, the reformer John Calvin challenged those in papal territories with similar views to throw off the mask of conformity to Catholic authority and profess their convictions openly. He addressed this appeal to “Nicodemites,” an allusion to Nicodemus who had wished to follow Jesus but refused to visit him except by night. Calvin may have touched a nerve with his accusation, especially if it is true that Michelangelo represented himself as Nicodemus in the Florence Pietà. Calvin and many other Protestants viewed reform as necessarily having a public component. But for Michelangelo it was a more internal matter of personal renewal, expressed in private poetry shared only with his closest friends and in art such as the frescoes of Paul and Peter that few people ever got to see. More observers were exposed to Michelangelo's most notorious painting, The Last Judgment, especially his fellow artists who flocked to see it. But Michelangelo coded its message in such a way that most of its meaning is still disputed. In this painting, everyone stands equally before the judgment seat. Even Peter, diffidently returning his keys to Christ, seems uncertain whether he will be accepted into heaven. All is in motion, all is entirely dependent on Christ's command, represented by his upraised right arm. No one could know whether they were saved, but they could rest secure in Christ's promise of grace. Ironically, the most conservative Roman Catholics saw eye to eye with Calvin on the danger Michelangelo and his friends posed in their rejection (or at least avoidance) of doctrinal authority and the necessity of institutions. At this point in time, there was a wide range of theological options. The division between “Catholic” and “Protestant” did not yet even come close to being black and white. But that was starting to change. "Make the world a suitable place"
Throughout the papal election in 1549, Cardinal Reginald Pole was the favorite candidate. But he lost— by one vote. A marvelous opportunity for unity was missed, and shortly thereafter the ruptures between Catholic and Protestant did indeed become permanent. It was not until 1563, a year before Michelangelo's death, that the Council of Trent finally concluded its work, leaving behind it official doctrinal definitions that the church had never had before. Among these was justification as a matter of faith and works, of private belief and public action. The Benefit was put on the Index of Prohibited Books, and some of Michelangelo's most high-profile work came under severe criticism, including censorship in the form of repainting. Interestingly enough, the Pauline frescoes did not attract this kind of criticism, perhaps because they were insufficiently well known. But that popes of the counter-reforming rigor of Pius V (1560-1572) found nothing objectionable in them suggests that Michelangelo had touched a very deep chord at the papacy's heart. By Pius's time, public expression of views like Michelangelo's became imprudent. Nevertheless, Michelangelo himself remained an almost untouchable icon. He had invented a new role, the artist-creator, free to do whatever he or she wished, in whatever domain, unhampered by any constraints other than the limits of his or her genius. 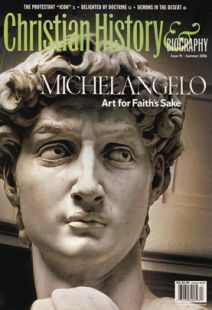 Michelangelo's art was a tremendous contribution to the history of Christianity that survived and flourished precisely because it could be read in so many ways. Thomas F. Mayer is professor of history at Augustana College in Rock Island, Illinois. How a book about one man's radical quest for God helped to redefine Christian discipleship and launch the monastic movement. The masterpieces of Fra Angelico showed painter Bruce Herman the beauty of Christian truth—and his own calling as a Christian artist.